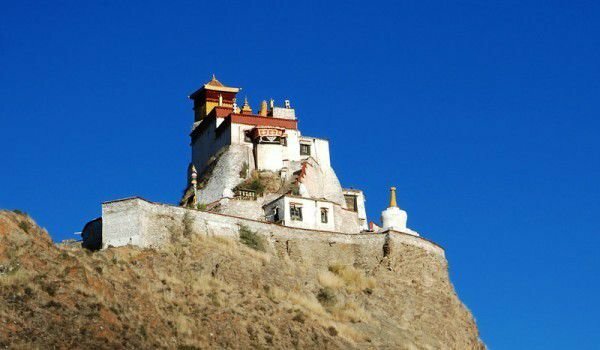 The Yungbulakang Monastery is the first palace in Tibet, which has become a monastery. The unique construction of the monastery Yungbulakang has nearly 2 000 years of history and today is considered one of the oldest buildings in Tibet. This Tibetan shrine is located on the picturesque mountaintop Jormo Zhaxi Ceri, which stands on the east bank of the Yarlung. The sleek complex Yungbulakang stands about five miles south of Tradrug County. Seen from far away, the monastery seems inaccessible, with its architecture reminiscent of a fortress. Lhasa is located 129 km southeast. According to Tibetan dialect, Yungbulakang is the palace of the mother and son. "Yumbu" literally means female deer or doe, but this name comes from the fact that the mountaintop Jormo Zhaxi Ceri resembles those animal forms. The word "Lakang" means sacred palace, with the result that it is accepted that the name of the monastery Yumbulakang means "Palace of mother and son." According to legend, a millennia ago Tsenpo who was the son of God, first descended on a ladder from heaven. 12 shepherds that fed their animals in the Tsantang Plains saw him and made him their king. God's messenger was called Nyatri Tsenpo and decided to build his palace in Yungbulakang. This happened somewhere around the second century BC and Yumbulakang became the official seat of the first Tibetan king. Much later the palace became the summer residence of Songtsen Gampo and Princess Wencheng. In the seventh century, Songtsen Gampo moved the capital to Lhasa and Yumbulakang gradually became a Buddhist monastery. The fifth Dalai Lama made Gelkupta, the monastery of the sect (yellow caps). The monastery Yumbulakang was destroyed during the Cultural Revolution, then underwent a major reconstruction in 1980. Inside the Yungbulakang Palace are beautiful murals that tell the early history of Tibet. The ground floor of the monastery was assigned to celebrate the Tibetan kings. Now here you can see a large statue of Buddha, and the figure of the ruler Nyatri Tsenpo on the left side. In the opposite direction lies the statue of Songtsan Gampo. On all the walls you can see statues of Tibetan rulers, thinkers, ministers, governors, etc. On the first floor of the monastery Yungbulakang is placed a figure of Avalokiteshvara, and Sakyamun. It is believed that the statue of Avalokiteshvara is as ancient as that of the Potala Palace. The highest point of the monastery Yungbulakang is a tower, which is now open for public visits. The view from the valley is really something amazing. In the past, this tower in Yungbulakang served to house many Tibetan princesses.